Seeing Green is a guide to the sustainability walking tour of downtown Raleigh, NC for iOS devices. It guides users through a circuit of 28 buildings and landmarks in downtown Raleigh that were sustainably built or promote sustainability in some other way. 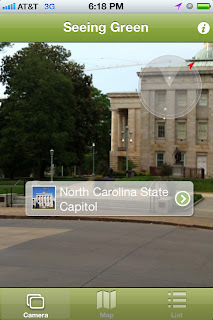 Stops on the tour include the North Carolina Capitol Building, the Cree Shimmer Wall, and the various electric vehicle charging stations in the downtown area. In an augmented reality viewer, which displays an overlay of information on top of the device's camera feed. Users hold the device up to view additional information about what they see in the real world such as the names and addresses of stops on the tour. In a map viewer, which displays the user's location and the location of all of the stops on the tour on a Google map. Users can tap on pins on the map to see more information about each point of interest. In a list, which displays the images, names, and addresses of all of the stops in order. Each of these views link to a more detailed view for each individual stop on the tour that displays a description of the landmark as well as the name, address, and a photograph. Check out Seeing Green on GitHub.